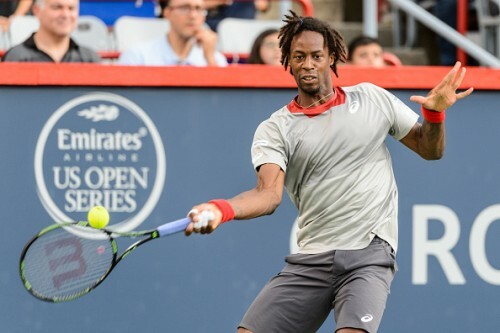 Gael Monfils started his Montreal Masters campaign with a comfortable 6-3, 6-1 win over Fabio Fognini in the first round. The Frenchman saved a break point in the opening game, before breaking Fognini’s serve in the third game to go 2-1 ahead. Fognini had a chance to break right back, but couple of aces from Monfils ensured he stayed with the lead. The Italian squandered a 30-0 lead in the ninth game to hand Monfils another break. Monfils won 63% of his service points and saved six break points to take a one set lead. Fognini fell behind 30-0 in the first game of the second set and two double faults did not help his cause, giving Monfils the early lead. The Frenchman won the next four games in a row before Fognini held his serve for the first time in the second set. Monfils held his serve to love to move to the second round in Montreal. He faces Luxembourg’s Gilles Muller in the second round. Muller got the better of wildcard Philip Bester 6-2, 6-3. Gilles Simon also advanced to the second round with a 6-2, 6-4 win over Andreas Seppi. The Frenchman won 63% points on serve and converted 3 out of 5 break point opportunities in the match. Simon will face the winner of the match between Viktor Troicki and Mikhail Youzhny in the second round. Thomaz Bellucci beat Pablo Cuevas 7-6 (4), 4-6, 7-6 (4). Ivo Karlovic beat Jerzy Janowicz 6-4, 7-6 (6). Leonardo Mayer beat Hyeon Chung 6-3, 6-4. Sam Querrey beat Martin Klizan 6-3, 6-3. Tommy Robredo beat Feliciano Lopez 6-3, 3-6, 6-3. Sergiy Stakhovsky beat Filip Peliwo 6-1, 5-7, 6-2. Bernard Tomic beat Joao Sousa 6-3, 6-3. Donald Young beat Denis Kudla 6-3, 6-4.